Windows Phone Now, it is already possible to manage the Project tasks of our Project management software from your Smart phone with Windows phone. This feature is very easy to use, since when you login from your smart phone, the first screen that appears is the "Task for Today". This way you do not need to connect your Pc to internet, you can do it from your mobile. It is already available MySaaSPlace for Windows Phone. 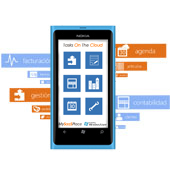 Download for Free your app of MySaaSPlace for Windows Phone here. You can also install your application from you smart phone if you look for “Task on the cloud” in the Market Place of Windows Phone. Now, it is already possible to manage the project tasks of our Project management software from your smart phone with windows phone. This feature is very easy to use, since when you log in to your project management from your smart phone, the first screen that appears is the “Task for today”, In this way, you do not to connect your pc to internet you can do it from your mobile. In the same way you can manage the session which you have inside a task and you can login to this task or take it as finished when you finish your work. You have all the information of the task in real time and from anywhere, the time that you have estimated for your project and the resources used. As it could not be otherwise, in every project is necessary to have the project information at hand, for example, If you are in a building work and you need a document which is uploaded in the project, you will be able to see it from your Windows Phone 7. Do not hesitate, if you are looking for Project management software which best suits your needs, MySaaSPlace is your best solution, sign up and use the best project management software on line for free forever.